We all love to get out of cooking by heading to the nearest restaurant, right? I know I love any chance to get out of making dinner. But can we do it healthier? Also, if you're are a working man or woman sometimes making meals at work is tough. So how do you choose something healthy when you can't get home? 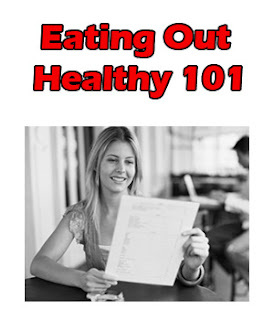 Restaurants: Check for their low fat or low cal menu items. Most restaurants have sections committed to programs like weight watchers. These are great places to find healthy options! When your waiter comes with your meal, ask for a to-go box right away and put half away for leftovers. This will control your portions and give you more for the money! For some reason we always think we have to eat everything on the plate and restaurants have HUGE portions! Don't be afraid to ask for a substitutions. Skip the fries and go with a side salad with vinaigrette dressing or steamed veggies. Even a baked potato is better than greasy fries. Fast Food: I once heard the saying that going to McDonald's for a salad is like going to a whore for a hug. And besides often times salads are actually worse for you than other menu items. Grab an app that gives you the nutritional info for almost any well known establishment. If you don't have a smart phone look up online and maybe print a few of your favorite menus with info. How are you going to be healthy while eating out? Eating out is hard when trying to be healthier. Since starting this I actually haven't gone out to eat at all! A whole month is pretty crazy for me! I really like my hamburgers and fries some days! But in the end it's worth it. So usually if we're going out I save what calories I can and enjoy the eating out. But definitely control the portion and just bring home half for lunch the next day!